Someone is selling it cheap and can give no details apart from it is a 6 series. No extra molex power 6200? 6800 Vanilla. Way too big for a 6600. 12 Pipelines and standard DDR. Last edited by Pitch; 27th October, 2006 at 08:09 AM. 6800 vanilla has extra power. Mine does. Will not boot with out it . Last edited by Pitch; 27th October, 2006 at 01:47 PM. You do realise, all you've done is proove how nerdy you are? 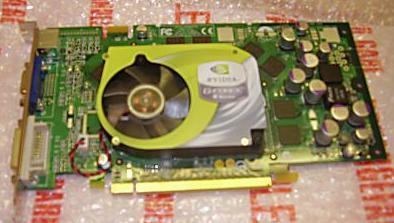 Able to identify an exact gfx card and model and spec from a blurry small picture? Dude...do you have like special glasses on or something....!! Give me your special glasses. NOW! yeah, but your running AGP bud.....PCI-E spec delivers more power through the slot. Last edited by tiamat63; 27th October, 2006 at 04:38 PM. Thats very impressive pitch, thanx dude. Its still very cheap atm, but you know how flea bay is, prob get 20 bids in the next few hours. Last edited by ajopz; 28th October, 2006 at 02:25 PM. just hope it works when it gets here. You scored ajopz, did you snipe it at the end? Yah I'm still AGP, PCI-E who needs it with all of it's fangdangled stuff and extra speed! Yes, put a bid of £40 on it with 30 seconds to go, tbh I was expecting to get outbid.